Since our inception, our firm is affianced to introduce a premium quality array of Advertising Table. 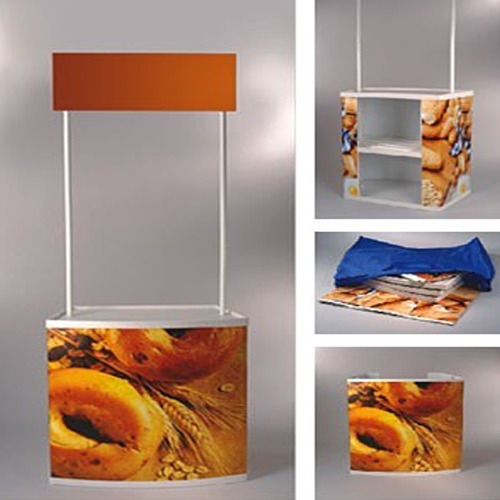 The table is used for serving and promotional purposes in the commercial arenas. We manufacture the table using quality raw materials and advanced technology. The offered table is light weighted and easy carry. Clients can get the table from us at cost effective rates and can also opt for custom designs according to the requirements. Minimum qty - 5 nos. for above price. Price may vary subject to quantity. Annual Turnover Rs. 50 Lakh - 1 Crore Approx. We "Shree Siddhivinayak Fabricators" are engaged in manufacturing a high-quality assortment of Display Stand, Banner Stand, etc. We are a Sole Proprietorship company that is established in the year 2005 at Mumbai, Maharashtra, India and are connected with the renowned vendors of the market who assist us to provide a qualitative range of products as per the global set standards. We also provide Printing Service. Under the supervision of "Mr. Rajesh Makwana", we have attained a dynamic position in this sector.